Four Bedroom, Two and Half Bath Colonial with 400 +- Sq Ft beautiful additional living space/ in-law suite with private entrance. 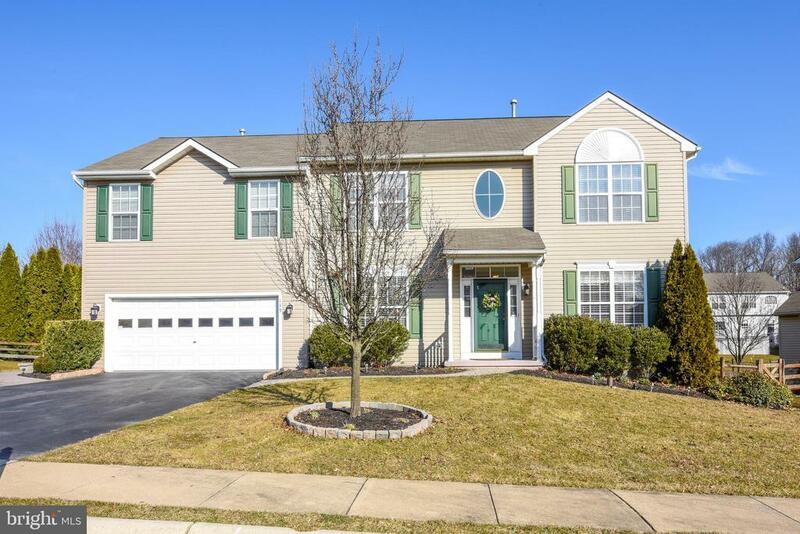 Located in the very desirable Branford Village section of East Fallowfield Township. This move in condition home, has been very nicely maintained inside and out. As you first walk thru the elegant front door, take note that the entire first floor has 9~ ceilings. Just inside the door is a very nice sized sitting room with large windows for an abundance of natural light. Custom Hardwood flooring adorn the Foyer and Dining room, and include chair-rail molding in the dining room for those Holiday gatherings. To the right of the foyer is a recently updated powder Room. Through the foyer, take note of the brand-new carpet in the large and open Family room which boasts a beautiful gas fireplace for those cold Winter nights. The spacious eat in Kitchen features an extended countertop for additional seating and overlooks the Family Room which has six-foot glass sliding doors, with built in Mini-Blinds, and overlooks the nice sized updated deck with Trex Planking, top hand rail and fenced rear yard lined with mature Arborvitae~s. Just off the Kitchen is the Laundry room and access to the garage. Proceeding up the recently carpeted main staircase of this Home, leads to a large open landing overlooking the foyer below. The nice sized Master Bed Room offers vaulted ceilings, two large walk-In closets, On-suite Full Bath with soaking Tub, double bowl sinks and a separate stall shower. Three nice sized additional Bedrooms are also on this level. You will find an abundance of natural light throughout this Home. There is a full-sized basement just off the main 1st floor foyer with ample storage. There is inside and private outside entrance to the recent 2nd floor addition to access the 400+- square foot additional living space with combined kitchen, Living Room, Laundry, 1 Bed Room, Full Bath, 2 closets, hard wood flooring throughout and separate HVAC units. The additional living space is currently being utilized as an In-Law Suite. With custom Hardscaping leading to the front and side entrance doors, and Belgium Block accenting the nicely landscaped front and rear yards, level driveway and two car garage round out this Beauty. This Home is wired for a back-up generator. With all this, the proud Sellers have also included a 2-10 Supreme Home Warranty. Walking trails connect to the East Fallowfied Community Park. Come take a look, but plan to stay. This Home won~t last.